One Of A Kind PreWorkout Without Caffeine or Beta Alanine! 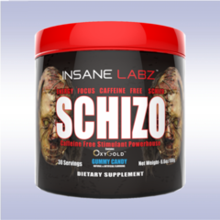 SCHIZO is a one of a kind tasty stimulant/focus based pre workout that does not contain Caffeine or Beta Alanine. Most people believe the only way to achieve an energy level that is unmatched is to over dose on Caffeine. Here at Insane Labz were innovation comes first, we take the alternative route and show you the customer the respect you deserve. 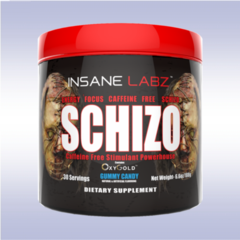 Insane Labz SCHIZO uses a key ingredient called OXYGOLD which can only be found in Insane Labz products worldwide. OXYGOLD can assist your bodies natural ability to utilize other ingredients, vitamins, and nutrients in a more efficient way therefore you use what you consume rather than waisting it. If you want a great stimulant pre workout without the itchy tingles SCHIZO is the product for you.